For the club outing on Sunday 5th August we travelled east to County Waterford. We left town at 08.00 headed to Kilclooney wood. Stopping in the heritage town of Lismore for tea /coffee. The weather was a little overcast, but with a promise of sun. We changed into our hiking gear, and took the path that meanders through the forest.Reaching a forest road we turned right, and passed the fake tree which disguises a communication mast. Eventually we reached a stile and turning left up a boulder strewn dry river bed..
Then the serious climb began. Our first destination was a prominent rock shaped like a rabbit, or frog depending on how vivid your imagination is...This was a conversation killer and we made steady progress... Reaching the rock we made our way to the rocky ridge that rises to the south of Coumshingaun Lake.This is a steep climb. To our right the lake came into view. Coumshingaun Lake is apparently one of the best examples of a Corrie lake in Western Europe. Reaching the first of the rocky outcrops, we rested up and admired the rich pastures of Waterford stretched out below us. Upwards we went to another prominent outcrop, then our route leveled out a little. This made for pleasant walking above the great gullies that thumble down to the lake hundreds of meters below. the Comeragh plateau. We were on Fauscoum Mountain the highest point in the Comeraghs at 792 meters. However we did not go to the summit which was five hundred meters further on due west. 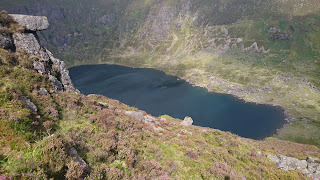 Our route was along the back wall of the lake with a sheer drop of 365 meters to the brooding lake. Here we were literally above the clouds, and it made for very atmospheric walking, with the sun playing hide and seek. On a clear day one can see as far as Hook Head in Wexford, and the Waterford coast. However there was a haze in the distance today...We continued around the rim of the lake and decided to have lunch when we got to the rocky outcrop at Stookangarriffe ridge.. This is a long knee jarring descent with heather and rocks making it a long slow slog downhill. Reaching the sanctuary of the rocks, people found their own comfortable niche. Back packs were opened and we feasted on sandwiches, biscuits, cake etc. All finished of with a desert of bilberries foraged from the mountain. Organic food at its best. Bilberries also known as Fraochans or Whorts are the wild cousins of the Blueberry. In Ireland especially during the World wars there was a thriving industry exporting them to Britain. Fighter pilots were convinced that their nighttime vision was improved by eating bilberry produce. Whole parishes took to the hills picking them. They were sold to local dealers who cleaned and exported them. It was said that bilberry money paid off long standing shop bills, bought schoolbooks, bicycles and even provided dowries.In 1941 there were 400 ton exported.